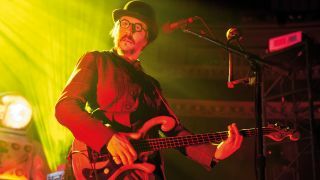 Among his multiple musical collaborations, writing novels, fly fishing and making his own wine, Les Claypool has somehow found the time to reunite with Primus, the band that in bass world at least, made him a household name. The ever-indescribable band’s latest album - their ninth - reunites Claypool with the classic line-up of drummer Tim Alexander and guitarist Larry LaLonde, and finds the trio venturing into some distinctly progressive territory. This is the first album of original Primus material in quite a few years, Les. What led to you guys going back into the studio? When you’re writing about goblins and rainbows, there aren’t going to be too many disco beats, are there? “Well, it was just time to do so. It just was time, haha! But I really wanted to do this project: this was something that I had been thinking about for a number of years, and as I’m moving through life I’m realising that I need to start knocking some of these things off my list. Tell us about the story behind The Desaturating Seven. It sounds like you’re playing chords in The Seven. What’s your approach to playing chords on the bass? As a bass player do you find that you react differently to the drummers you work with, and if so, what are those differences? “Well, I like to use the conversation metaphor quite a lot. When you’re playing music, especially if you’re trying to be spontaneous, it’s very much a conversation - so having conversations with different individuals is going to be very different. Doing an interview with you is pretty different to the interview I did 10 minutes ago. You’re going to go down different paths, you’re going to touch on different subjects. Which basses have you used on the new album? Tell us about the process of writing the songs. “Well, all of the songs were initially me sitting down and trying to interpret parts of the book. I broke the book down into six different sections and I just said: ‘This part needs to represent the battle, this part needs to represent the journey, this part needs to represent the dream…’ hence the cryptic titles! What’s happening with the opening to The Dream? How did you get started with slap technique? Who were your influences? “I always squirm when people say ‘slap bass!’ I was a guy who grew up watching Larry Graham, and he used to have a song called The History Of The Bass, and in that song he talks about the thumpin’ and the pluckin’. “When I was a kid in high school back in the late-'70s, I remember seeing Louis Johnson on [a TV variety show] and he was definitely thumping the bass; like I say, they always called it thumpin’ and pluckin’. I never even heard the ‘slap bass’ term until the '90s, when all of a sudden there were guys like me coming into the public eye. You seem to use fretting hand slaps quite a bit, such as in Lacquer Head. Was this something you found yourself, or the influence of another player? 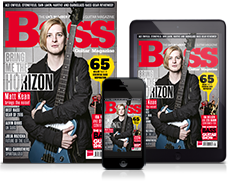 Do you have any advice to share with young bass players? “Practise. How’s that? Haha! You know, bass just happens to be the crayon I pulled out of the box. If I was playing trumpet or accordion I would be making similar music, but just a different timbre. The Desaturating Seven is out now on ATO Records.